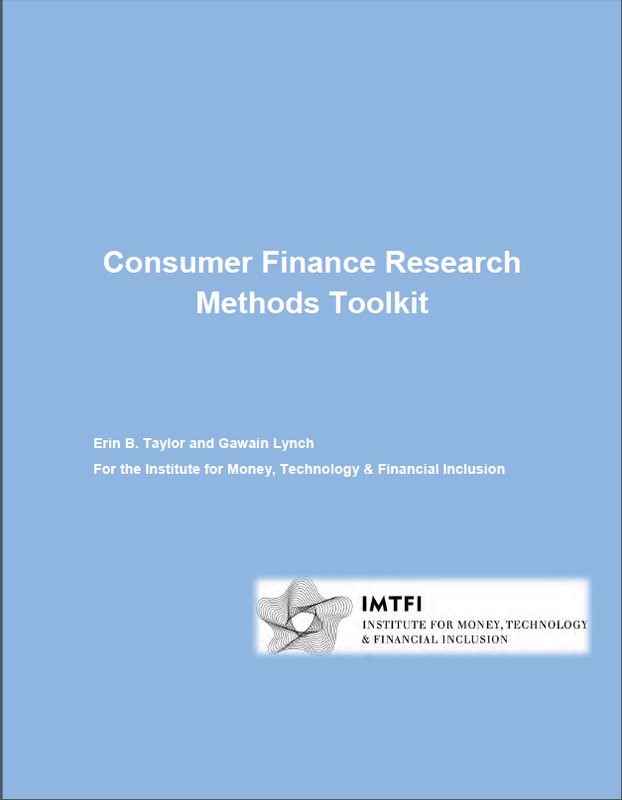 Consumer Finance Research Methods Toolkit (BETA Version) available now! Are you curious about how to design a research project on Bitcoin? Interested in enlivening your interview research with object-centered methods or social network analysis? How do you adapt research on financial management practices in locations as different as the San Francisco Bay Area and the border area of Haiti and the Dominican Republic? 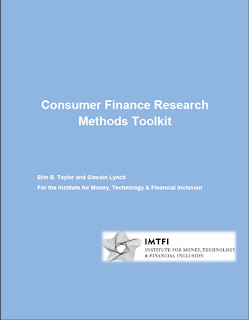 Find answers to these questions and more in our Consumer Finance Research Methods Toolkit. Download a copy of the toolkit here! The toolkit is a "living document." We hope to incorporate your suggestions, ideas for content, further case studies and useful resources. Please send comments and feedback to cfrmptoolkit.imtfi@gmail.com or you can complete our user experience form. Video of Keynote Address: "Buckle up! An Eclectic Journey of Mobile Money in Kenya (and Beyond) - Insights & Impacts of Research" - now available on IMTFI's YouTube channel. Ndunge Kiiti, Visiting Professor, CIIFAD, Cornell University, delivered a moving final keynote to the conference in describing her "research journey" with IMTFI. As someone who has followed Kiiti's progress over the years, starting with this blog post from 2011, I agree that it's been an inspiring voyage to observe. In covering IMTFI since its inception, albeit as a relative outsider who specializes in e-government and e-learning rather than e-finance, I've been particularly impressed by the innovation and creativity of researchers who have received multiple-rounds of funding and the ways that their curiosity has let them to new research questions. Visiting field sites and doing in-depth interviews with researchers last year made me aware of the limitations of conference blogging, but even in the conference setting it is clear the Kiiti is thinking about vulnerable populations capaciously, collaborating with researchers in many disciplines, challenging the biases of the industry, and transforming the possibilities for high-impact practices in higher education here in the United States. She began by explaining why her expertise in Kenya might be particularly useful for thinking about large scale adoptions of mobile money more generally. In addition to having moved through a series of paradigms ("transfer," "platform," and "digital ecosystem"), planners for the Kenyan e-money economy benefitted from networked device ubiquity in the context of a robust legal and regulatory framework and a wealth of market research. The Kenyan case is also compelling by virtue of its sheer volume: up to 50% of mobile money transactions ($10 billion) on a global scale with approximately 26+ million subscribers using networks with 127,000 agents. With the value of transactions approaching 55% of the GDP, Kenya surpasses other developing countries. (Tanzania is in second place, Botswana in third, and Zimbabwe in fourth.) Researchers have also benefitted from synergies with humanitarian affairs and relief aid, because cash transfers have been used for philanthropic purposes, including for domestic fund raising. She cautioned against embracing "big data" too quickly, however, because of tensions around the ethics of access. "Are we creating more vulnerability?" she asked in balancing usage against privacy. She emphasized how many of her populations lived in conditions of precarity, as she described how working with women’s groups (including with 14 women who were blind) led to an interest in studying people with visual impairment. She also described her work with the “Jua Kali” (informal business sector), which is highlighted in the below video. In the process she has traversed many disciplines, including social sciences (encompassing anthropology, gender studies, psychology, sociology, and political science), humanities (encompassing linguistics), natural sciences (encompassing biology), formal sciences (encompassing computer science and statistics), and professional applied sciences (encompassing agriculture, business, communication, education, law, and social work). She encouraged participants to draw their own interdisciplinary maps as well. She identified many building blocks to her scholarship: research process, conferences/workshops, academic forums (as someone who teaches), information dissemination, consultative roles, and even informal dialogue. The outcomes from such a polymorphous approach could be particularly fruitful: investing in people and building capacity, recognizing that grassroots has the ability to inform policy, curricular development, and facilitating a global network that recognizes development as a process of reducing vulnerabilities and developing capacities (in which she cited Ravi Jayakaran). She lauded openness to pilot testing as a way to go beyond learning theory to thinking more broadly about methodology. As an example of the challenges of capturing data, she described how one focus group of artisans might still be making necklaces or working on soapstones, because "they can't stop for a minute." Thus data gathering also involves diverse skills in listening and building rapport. She also discussed the importance of taking her students from Houghton College to Kenya to perform fieldwork in the three studies. Students wrote senior honors theses, used their experiences to get jobs in Washington D.C., and developed as future professionals by being forced "to think out of the box." She noted that she "always used workshops" as well, particularly as venues for engaging policy makers. At Kenyatta University, a powerful skit by visually disabled had an impact on Safari.com representatives. One of her workshop participants, Dennis, was visually impaired and yet worked as an M-PESA agent. She is also collaborating with a University of Nairobi professor in trying to develop products. As a visual aid, she described always carrying the Kenyan Constitution with her, as proof of "things our government has committed to." As an example of her public advocacy, she asserted that participating in roundtables sponsored by The Guardian, such as this one on "Giving women control over their finances" could reap multiple benefits, as might attending expert meetings for UNCTAD (the United Nations Conference on Trade and Development), which she does as well. In speaking in Geneva about how remittance dynamics might have a gender component, she sees herself as making sure "our research is not getting lost." Although IMTFI researchers often build close relationships with their informants on the bottom of the pyramid, she wanted to "challenge all of us" to "keep a foot in the macro" in our information dissemination activities. She insisted that it was necessary to become fluent in many genres and media to get the word out, including news articles, videos, newsletters, blogs, and even museum displays, such as the display at the British museum, which was curated by Ellen Feingold, about Money in Africa. In grappling with issues about injustices and human rights, she argued for frameworks that require many disciplines and many communities. As she insisted, we are all "part of a bigger family." In closing, she thanked IMTFI for forging more "family" ties, including with Mesfin Fikre Woldmariam of Ethiopia, for sharing strategies for "investing back in our countries" for "marginalized people in our communities." 1) He praised the value of comparison when participants can hear "from so many cases" and "many countries," where financial participation takes many forms, including "different traditional practices" and "different new practices," thus allowing them to "take concepts that emerge in one field site and use them analytically in another field site." Such concepts could be generated from informants or even be borrowed from business, as in the case of the term "ecology of services." This comparative perspective might be dense and layered and never pristine like the yak trails in the presentation on Nepal. Rather than one-to-one comparisons, the frameworks might include access points, network coverage, device proprietors, and "interrelationships and feedback loops." 2) He expressed appreciation for the group's "healthy skepticism about financial inclusion and inequality," which "erupted into the discussion today" about "what we think we are doing when we try to include people," because "one size really does not fit all. For Maurer, "a responsible financial inclusion" involves thinking with that skepticism through "strange pathways and intersections." 3) He thanked participants for their candor and willingness to share their "own stories," including a presenter sharing her experience of losing her debit card. He noted that "we are ourselves" are "a rich font of data about money and technology." Willingness to "reality check" financial inclusion myths with the facts of researchers' personal lives keeps professional lives honest and may check the urge to express only "the right thing to say." After all, IMTFI research is about "what you were actually doing at home" or "the things your husband doesn't know about." 4) He lauded the crosstalk, particularly in citing other projects, and asserted the value of a "community of inquiry that is shaping the debate" by "building on conversations. " The challenge, as Maurer saw it, was that "we get really good at trucking in complexity, but the challenge is getting it heard." He pointed to "these instances where we have been able to break through" and thus "move the needle by bringing our complex stories" from an "incredibly diverse group" participating in a longstanding mixed method interdisciplinary forum. In closing, he restated that his challenge was "not only to finish your projects," but also to "think about how you can translate that insight into impact." The final panel of the conference was devoted to "Up(S)takes of New Financial Tools and Technologies" with discussant Sonia Arenaza of the Better Than Cash Alliance of the United Natons Capital Development Fund. Arenaza praised the from-the-ground perspective of panelists that provided "a human and social dimension" for developing digital financial services for underserved populations with the aim of creating a more "inclusive digital ecosystem" that considers social dynamics and ways to "broaden" connective chains. In "Separate self, interdependent self and new financial technologies - Lessons from rural southern India" Venkatasubramanian Govindan of the French Institute of Pondicherry described research in the field in Tamil Nadu as rural southern India undertakes a "massive effort to bank the unbanked citizen" with a focus on women and Dalits. The Prime Minister's ambitious Pradhan Mantri Jan Dhan Yojana (PMJDY) initiative, which combines access to accounts with biometric authentication, attempts to launch new financial inclusion efforts on a massive scale. (For more on PMJDY, see this IMTFI interview with Dan Radcliffe, which provides more information about this time of rapid change in India.) 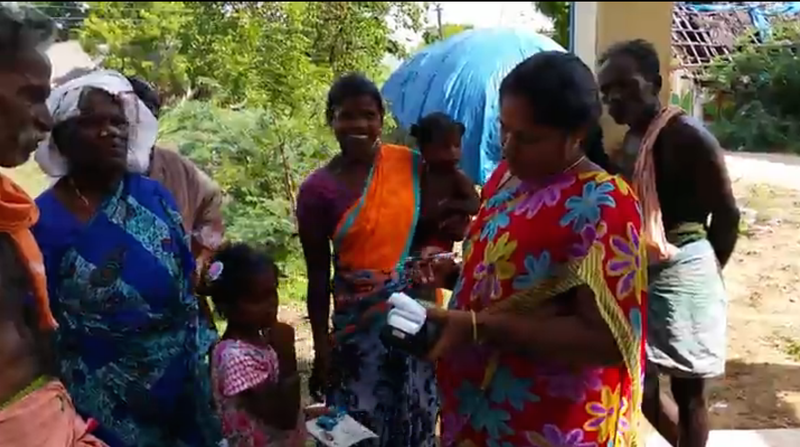 As Govindan explained, existing systems for smart cards and cash delivery -- combined with NREGA (the National Rural Employment Guarantee Act of 2005) -- have created bureaucracies that aren't always easily accessible to villagers or comprehensible to their lifeworlds. Govindan lamented the fact that with these ubiquitous computing devices there may be "problems with maintenance" and "few sites" capable of repairs. In the litany of other woes, he also mentioned insufficient cash, short battery charge life, inadequate transfers of the BC, and limited amounts on transactions. Furthermore, there may be caste conflicts governing who can hand cash to whom, which can be exacerbated when banks assume there are no distinction issues about accepting payment. He also shared a number of everyday practices of financial upkeep in an environment in which keeping bills is very uncommon by thinking about "the effects" of different financial inclusion efforts "in terms of worldview." He noted that financial calculations were often significant in planning for ceremonies, particularly ceremonies of marriage, puberty, and housewarming. A key life event might drain 4-8 years of household income, but such investments were critical in building respect (raiyatai). He noted how the "continuous chain of reciprocity" and local understandings of "accountability and debt payment" were important. He also stressed the importance of "mental accounting" among people with "little written culture" and how structures in which one person would be in charge of the family memory, including its financial memory, functioned. He closed be reiterating how the gap between financial inclusion objectives and people's practices had to be acknowledged, particularly "how people translate" when new initiatives are launched. A second round of household surveys is planned for the next phase of research. "Cross-border Transfers as a Strategic Tool to Promote the Diffusion of Mobile Money in Rural Areas. The Case of Burkinabe Diaspora Living in Ivory Coast" by Solène Morvant-Roux of the Univesity of Geneva, Simon Barussaud of the University of Geneva, and Dieudonné Ilboudo of the National Centre of Scientific and Technological Research in Ouagadougou (CNRST/INERA) examined mobile money diffusion and its role in the economies of transnational migration. The research team -- not all of whom could come to UCI -- began by providing an outline of their presentation, which followed the conventional social science template of "background," "methodology," and "findings" as its basic structure. Morvant-Roux presented the existing empirical evidence on mobile money diffusion and usage on the domestic level before moving into their own case studies examining urban-rural transfers, where they were looking for international transfers between Ivory Coast and Burkina Faso. Researchers hypothesized that the introduction of mobile money in 2014 might be attractive to participants in the longstanding migration dynamic because of poor roads, spotty Internet services, and weak security, but they were wary of assuming patterns of usage that were solely instrumental. They planned their study by looking at the provision of mobile money services in comparison to other services, and they wanted to consider both the supply side and the migrant side of adoption potential. They also considered age, gender, location, and mobility as explanatory factors, as well as an analysis of the broader socio-economic and socio-political context. For migrants, "maintaining ties to one's own country" might be complicated, and the "emergence of new brokerage dynamics" might take surprising turns. Barussaud explained how they conducted the survey first in Ivory Coast and then in Burkina Faso during January and February. 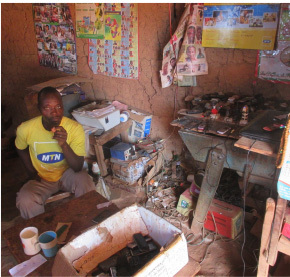 He described how they undertook to survey a "broader view" of mobile money diffusion by deploying a mixed methods approach, which included 250 interviews, 337 transfers, focus groups, and analysis of secondary data. They chose the first field site based on immigration data. It was a site dominated by coffee plantations, where foreigners in area accounted for 45% of the population. The second area was chosen based on the first, as the origin point of significant chain migration. By identifying two major hubs, they hoped to better understand family configuration (which was transnational and often polygamous and constituted with an average of 12 members) and economic activities related to the 80% of migrants laboring on cocoa and coffee plantations, although there had been attempts at diversification with farming rubber trees and palm nuts. The picture of financial practices showed low formal inclusion at a level of less than 20% of participants and the characteristics of income seasonality. Researchers focused on recent and regular transfers, at a typical rate of 5-7 per year, as part of the rhythm of migration pattens that were now over 20 years in the making with a number of second-generation migrants in the mix. Data collection tools included discussions with migrant workers and spouses and family members (155 family members in Ivory Coast and 100 in Burkina Faso), as well as geographical methods including geopositioning and light surveys. They also looked at census data and the typology of remittance service providers, to understand the supply-side dynamics. International companies (like Western Union and MoneyGram) had been providers since the early 2000s, but these companies relied on Internet technology and consequently had a very reduced network. West African companies (like Wari, and Quick Cash) were able to take advantage of GSM technology and had been subregional economic players since 2010. The third set of actors on the supply-side had been the newer M-wallet services. Because mobile money induces a spatial diffusion of financial and transfer services, researchers wanted to look at the difference between 2012 and 2015 in mobile money diffusion. Uptake was often frustrated by a number of factors, including the difficulties of cashing out, spatial disparities, interoperability challenges that could lead to network disturbances, and the exclusion of women. In addition to gender gaps and generational gaps, there were also issues of illiteracy and mastery of technology, as well as trust gaps and innovation reluctance. The sessions with the in-process researchers ended on a playful note with "Exploring Rosca Dynamics with a Cambodian Factory Worker Board Game" by Andrew Crawford of Monash University who had been working with IMTFI to create a game about Rotating Savings and Credit Associations. Crawford has a history of thinking about entertainment and affect in financial inclusion efforts. For example, you can read about his work on promoting financial literacy through television comedy, particularly on buses, here. Crawford began by thanking those at the IMTFI conference who had during lunch played the Tong Tin Game. (See below for a photograph of play testing at the IMTFI conference.) He noted the distinction between more static ROSCAs and bidding ROSCAs, that already incorporated some elements of gamification. (For more explanation of how gamification works, see this online course from U Penn professor Kevin Werbach.) In a bidding ROSCA each member contributes a monthly deposit and a lump sum can be paid out to one member who needs access to credit and who bids the highest interest rate. From this structure can emerge poker-like dynamics of anticipating risks and bluffing. The idea for Tong Tin grew out of an original IMTFI workshop in 2014. Crawford showed video of IMTFI researchers listing their different needs that were translated onto cards, including money to travel to a wedding on other side of Cambodia, a husband who lost his job, a daughter who was pregnant, an opportunity to buy land, a husband was jailed, an a husband's medical expenses. (The concept of playtesting is central to the game design process for both commercial and so-called "serious games" created by nonprofit organizations and independent developers. See this list of best practices for playtesting to see how Crawford has integrated these principles. The rules of the game represent how people are incentivized to participate by the potential to make a high return, To reflect the economic environment of the garment factory the board is shaped like a button. On the 28-day circle representing the workers' factory month there is a square with a payday, a square with the ROSCA meeting, and other types of squares corresponding to green, red, and blue cards. The player begins the game with 100 dollars. In addition to payment on the payday, players may also have opportunities to buy assets like a chicken or experience setbacks like a dental crisis. Blue squares can move you either backward or forward. Approximately 70% of Cambodian factory workers are involved in Tong Tin groups, which offer additional opportunities to earn capital. Among factory workers, both cashing out and stealing occurs, but there is still a strong trust element. In the game you can help people and experience the dynamics around borrowing (including consideration of interest rates, indebtedness, and emergency funds) and strategize about savings and investment (considering factors like a high rate of return, storage of savings, and the ability to cash out). The game also models trust and loyalty in rates and flight risks and asset purchasing with borrowed funds. It is designed to educate young people about ROSCA risks and benefits. In addition to its didactic purposes as "a good way to understand the system," using a game also has many benefits to research. According to Crawford, "people don't want to talk about personal finance," but the "game format allows you to collect data" more naturally. He also showed video of playtesting with Cambodian workers, as the frame above taken from his footage shows. He organized 5 sessions of playtesting with his prototype, using 30 minutes of play with 8 players, 30 minutes of focus groups, and 30 minutes of one-on-one tablet surveys. Because factory workers had little time to spare, short sessions were critical for gathering data. He noticed some interesting quirks in the field site, including people's reluctance to draw cards from the top. He observed that a reliable chief player was critical to the game, as a figure for providing insurance as well as keeping hold of money. Crawford still plans some revisions based on his findings. In working with the prototype he realized that he had underestimated the cost of a pig stock. He also noticed problems with using clip-art illustration with stock images. As one informant noted of a conventional portrayal of a thief: "the white guy stole your money." He has been partnering with Winrock International, which is already in the region working on human trafficking and shares his enthusiasm for helping people learn "how to grow their assets instead of going to Thailand." He has concluded that more research from behavioral studies in anthropology and behavioral economics will be helpful and is planning use in schools in both developing and developed countries, so that more affluent young citizens might gain empathy for the challenges of managing money in developing country, and hopes to develop mobile apps with the game as well. For those interested in the possible etymological origins of his "Game to Reap and Sew," check out the eighteenth century investment scheme Tontine. The lively question and answer session emphasized the problem of "the one percent" in developing countries as asymmetrical stakeholders in inclusion efforts and critical reflection on the ethics of participation for researchers in countries in which wealth distribution is so uneven.